Why Vacker Sign? Over the years we’ve frequently been asked this question.Our business was named with the Swedish word “Vacker” by our dad (a very good Swede) due to its translation to —beautiful. Glenn received his art training at the College of Visual Arts and served as Art Director for a St. Paul advertising agency for over 40 years. His style and sense of design continues to be present in our projects today. 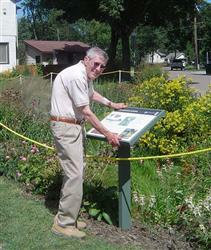 The photo here was taken within blocks of his childhood home in St. Paul’s Como Park neighborhood. Tack för din verksamhet och stöd. – Thank you for your business and support.